The ginger-garlic soup we suggest today is one of the most powerful natural remedies against any virus, colds, and the flu. Garlic is the most potent natural antibiotic on the planet, with a myriad of medicinal properties. Garlic contains two key compounds, a sulfur-rich amino acid called allicin, and a protein-based enzyme called alliinase. The clove gets its smell as soon as it is crushed or sliced, since these compounds need to mix and form a third compound, called allicin, that exists in raw garlic only, as cooking destroys it. It is a volatile compound that survives for just a few hours, and is a potent natural antibiotic. Garlic also contains about ten different kinds of natural sugars, including fructose, glucose, and insulin, and high levels of the trace minerals copper, iron, zinc, tin, calcium, manganese, aluminum, germanium, and selenium. It is higher in selenium than any other plant. It improves the ability of white blood cells to fight infections, and stimulates other immune cells to fight viral and bacterial infections, as well as cancer. Garlic has been valued as a natural remedy since ancient times. In ancient Egypt, it was used to treat 22ailments, while the ancient Greeks used it for everything, from curing infections, and lung and blood disorders to healing insect bites and even leprosy. The Roman soldiers took it to boost their endurance. From the Middle Ages on, it has been commonly used to prevent infections and treat wounds. Its poultrices have been used in the treatment of would infections from Roman antiquity through World War I, and Louis Pasteur performed some of the original work showing that garlic destroys bacteria. In 1916, the British government issued a general plea for people to supply it with garlic for their wartime needs. During World War II, this vegetable was known as Russian penicillin as after running out of antibiotics, the Russian government turned to its powerful to cure its soldiers. Washington State University found that garlic is 100 times more effective than two of the most popular antibiotics at fighting disease- causing bacteria that lead to foodborne illness. As soon as the garlic clove is crushed, alliin is converted into allicin. Allicin lowers cholesterol, prevents blood clots, and reduces blood pressure. It also prevents atherosclerosis, treats diarrhea and digestive issues, colds, earaches, and the flu. Helen Bond, a Derbyshire-based consultant dietitian, and spokeswoman for the British Dietetic Association says that this chemical has potent anti-bacterial and anti-fungal powers that boost the immune system. Many people are simply mashing up garlic, add olive oil and spread it on bread. The major investigation by the respected global research organization, the Cochrane Database, showed that the intake of garlic during winter cuts the duration of the symptoms of colds. Yet, major pharmaceutical companies are not interested in the investigation of the possible beneficial effects of garlic, since the findings will surely drastically lower their incomes. Scientists at the University of Florida found that the consumption of garlic can strengthen the immune system and fight viruses by boosting the number of T-cells in the bloodstream. Allicin was shown to defeat infections, improve blood flow, and prevent cardiovascular issues. Brazilian dentists discovered that garlic water destroys the germs that cause gum diseases and tooth decay. When it comes to the best way to prepare garlic, there are two schools of thought: while Argentinian investigators found that baking releases the allicin-type compounds in garlic, scientists at South Carolina Medical University maintain that peeling garlic and letting it sit uncovered for 15 minutes produces the highest levels of infection-fighting compounds. The following soup contains potent cold-preventing and virus-killing qualities, so it will drastically boost your immune system, and keep you safe during the season of colds and the flu. 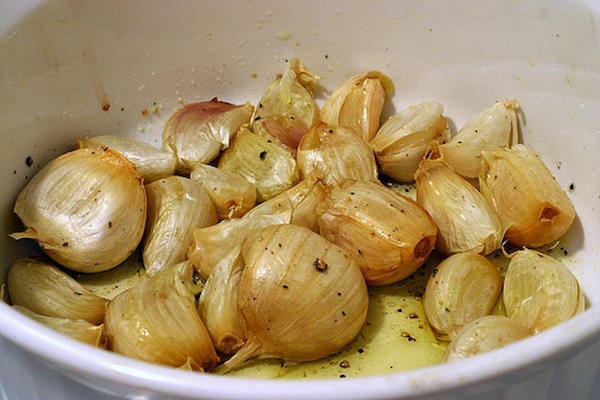 Preheat the oven to 350F, and in a small glass baking dish, mix the 26 garlic cloves, 2 tablespoons olive oil and some sea salt. Cover with foil and bake for about 45 minutes, until garlic softens and becomes golden brown. Then, cool, and squeeze it between fingertips to release cloves. Transfer the cloves to a smaller bowl. In a large saucepan, melt the butter over medium-high heat, and add the ginger, onions, thyme, and cayenne powder. Cook for about 5 minutes, until the onions become translucent. Add the roasted garlic and 26 raw garlic cloves. Cook for 3 minutes, pour the vegetable broth, cover, and simmer for 20 minutes. Next, pour the coup in the blender and blend until it becomes smooth. Then, return it to the saucepan, add the coconut milk, bring to simmer, and season with sea salt and pepper. Before you serve it, squeeze the juice of 1 lemon wedge into each bowl. Enjoy!